Are you thinking of making the military a career, or just join for four to five years prior to going to college? Do you want to learn a trade, or get college benefits? Are you interested in traveling the world? There are many reasons why people join the military. But joining because you cannot find anything else to do is typically not the best reason, though many of those who are uninterested in what the civilian jobs offer to find a home in the military as well. No matter how high your rank, no matter which service you join, there will always have a boss. Many times you won't like or agree with your orders, but you take a solemn oath to "obey the orders of the President of the United States and the lawful orders of those appointed over you." Disobeying those orders can have serious consequences. If you can't live with this simple fact, save yourself the hardship and the government some valuable time and money, and don't enlist. Travel is significant in the Army, Navy, Air Force, Marines, and even in the Coast Guard and National Guard. Expect to move often and be away from home six or more months at a time when deployed. If you like to smoke marijuana once in a while, don't join. The military uses random, no-notice urinalysis, and if you're found positive, you may very well go to jail (as well as being discharged). The DOD urinalysis test can find THC in your urine for three weeks after you've smoked a joint. Which Service Should I Join? Next, you'll need to decide which service you are interested in. Sometimes, you'll know this in advance. Perhaps you had a friend or relative who served or is serving in a particular branch of the military and you want to follow in their footsteps. You should give this matter much study and thought. Each of the services is different, and some people may be more suited (based upon qualifications, temperament, and/or interests) for one service vs. another. Make sure you select a service that you are interested in joining, based upon your interests. Don't join a service just because someone else liked it, or expects you to. It's your life and your decision. There are also differences in education benefits, assignments, job guarantees, education programs, and enlistment/re-enlistment bonuses. 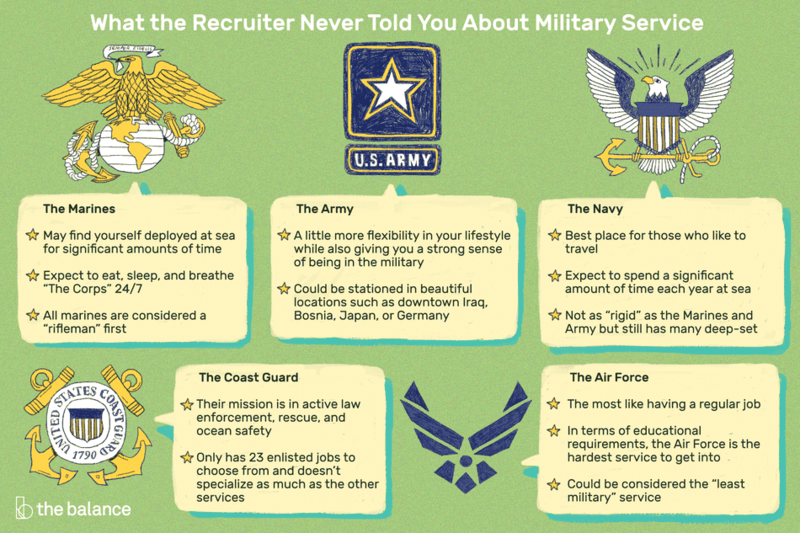 Recruiters see lots of folks who want to enlist and serve in one of these elite fields. The truth of the matter is that most people who apply for the "elite" programs wash out due to the very rigorous training requirements. If you enlist to become one of these "elites," and you wash out of training, you don't get to quit. You'll be required to serve the remainder of your enlistment contract in a different job. If you like shooting (a lot) and want a complete change of lifestyle, to include a deeply ingrained pride of service, commitment, and sense of loyalty, the Marine Corps may be what you're looking for. This may be a minor point, but it is very telling. When you ask an airman what he does, he will respond, "I'm in the Air Force." When you ask a sailor what she does, she'll respond, "I'm in the Navy." If you ask a Marine what he does, he'll say "I am a Marine." The Marines are also scattered around (although not in as great numbers as the other services). Recently, however, the Marines have been taking their turns in Iraq and Afghanistan. However, unlike the Army (and like the Navy), a Marine may find him/herself spending significant amounts of time deployed to sea on Navy amphibious ships. If you join the Marines, expect to eat, sleep, and breathe "The Corps," 24 hours per day, seven days per week. All Marines are considered "riflemen" first, plus whatever other MOS (job) they hold second. This is attributable to the high level of marksmanship training that all Marines receive. If you want a little more flexibility in your lifestyle, but still want a strong sense of being in the military, the Army may be for you. If you like to crawl through the mud and blow things up, using the latest and greatest of "blowing up toys," consider one of the Army's combat arms branches. You'll likely get all the time "in the field," that you want. The Army deploys a significant number of soldiers to Iraq, Afghanistan, Bosnia, and Kosovo, but Korea, Japan, and Germany are among the other beautiful and interesting places where you could be stationed. Many Army Combat Arms units, such as the infantry, Special Forces and Rangers, require significant additional training that is physically and tactically intense and has high attrition rates. The Navy is probably the best place for those who like to travel. There are only a few ratings (jobs) in the Navy that won't spend a significant amount of time at sea. This might be great if you are single, but might be something you'll want to think about if you have a family. In today's military, expect to spend a significant time away from home. The average Navy enlisted person can spend a significant amount of time each year at sea. On any given day, 40 percent of Navy personnel are assigned to a ship or submarine, and 35 percent to 45 percent of those ships will be deployed to sea. The Navy, while not as "rigid" as the Marines and Army, has many deep-set customs and traditions. For the "gung-ho" sailor, the Navy possesses special operations forces: Navy SEALs, Navy EOD, SWCC, and SAR Swimmers. The Coast Guard has the advantage of having a real, "peacetime" mission, in active law enforcement, rescue, and ocean safety. On the downside, the Coast Guard only has 23 enlisted jobs to choose from, and you usually cannot get a "guaranteed job" at the time of enlistment. On the plus side, pretty much all of those jobs directly relate to the civilian job market. Additionally, with fewer jobs, the Coast Guard doesn't specialize as much as the other services, and one may get a wider range of experience within a specific job. Coast Guard drug interdiction missions and port security missions are today focused on anti-terrorism as well as crime. The job can get pretty intense when arresting armed drug dealers on the high seas or rescuing stranded boaters in a storm. The Coast Guard Rescue Swimmers are highly trained and highly qualified members of rescue and life-saving teams around the country. Of all the services, the Air Force is probably the most like having a regular job. The Air Force is, arguably, far ahead of the other services in many "quality of life" issues such as dormitories and base housing units. If these things are important to you, then the Air Force should be something you look into. However, in terms of educational requirements and overall Armed Forces Vocational Aptitude Battery (AFVAB) scores, the Air Force (tied with the Coast Guard) is the hardest service to get into. Depending on your Air Force AFSC (job), and duty assignment, you may find yourself spending up to seven months out of every year deployed to such garden spots as Kosovo, Saudi Arabia, Kuwait, Afghanistan, or Iraq. The Air Force could be considered as the "least military" service, also has its share of "gung-ho," in the elite Combat Controllers and Air Force Pararescue forces. All of the services have a reserve component, while the Army and Air Force have a related National Guard as well. The primary purpose of the Reserves and National Guard is to provide a reserve force to supplement the active duty forces when needed. The biggest difference between the Reserves and National Guard is that the Reserves belong to the federal government, while the National Guard belongs to the individual state government. While both the Reserves and the National Guard can be called to active duty by the Federal Government, under the authority of the President, individual state governors can also call out their National Guard units to assist in individual state emergencies. Following basic training and job training, members of the Reserves and National Guard drill (perform duties) one weekend each month and two weeks every year. However, it's become more and common to activate Guard and Reserve units to supplement active duty deployments to such locations as Iraq, Kuwait, Bosnia, Afghanistan, and Kosovo. In addition to deciding on a military service, if you have a four-year college bachelors degree (or above), you should decide whether you want to join that service as a commissioned officer, or whether you wish to join as an enlisted member. Commissioned officers make a lot more money than enlisted members. Additionally, their "quality of life" is generally better (better housing, quarters, etc.). However, they have a much greater degree of responsibility. The competition for commissioned slots is tough, and merely having a college degree is not enough. Factors such as college grade point average and officer accession test scores are given much weight. It's also much harder to get approved for waivers (medical, criminal history, etc.) for commissioned applicants than it is for enlisted applicants. If you decide you wish to apply for a commission, ask the recruiter to refer you to an "Officer Accessions Recruiter." Once you've decided what service you're interested in, you may wish to make appointments and talk to the recruiters of all of the services that interest you. Do not go into the recruiter's office without an idea of what you are interested in pursuing as a job, and prepare yourself physically if challenging training is involved (SEALs, Rangers, RECON, Air Force PJ as an example). If you have no idea what you want to do in the military, the recruiter will steer you toward what the military needs. This will depend on your ASVAB scores as well. The better you score on the ASVAB, the more options available to you, so do a few practice tests and actually study for it if you want to do something that is competitive (Nuke School, Medical, Special Ops). Don't begin the enlistment qualification process, however, until you're sure what service you want to join. It's unfair to make a recruiter do all the work to pre-qualify you, set you up for testing and medical, then back out and join a different service.